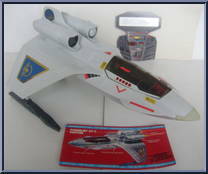 Description: Powerjet XT-7 is believed to have been developed by Captain Jonathan Power and his aides. 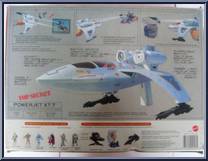 Craft design: Air Assault Stealth-Class fighter with fully-armed proton and ion beam systems. Defensive Systems: Full-load stealth equipment allows craft to move through surveillance without detection. EXCEPTION: Warlord Class Bio Dreads detection systems can seek and find Powerjet XT-7 within 200 mile range. PowerShield system allows mainframe protection for medium to mega force blast systems. Offensive Systems: Powerjet XT-7 contains massive firepower. Ion Blast system delivers full range of power blasts on call. Targeting is through laser-site unit tied to "lock-on" light systems. Note: All Bio Dreads should avoid contact with the Powerjet XT-7 unless backed by full attack group. 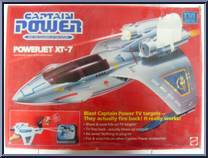 Current Status: The Powerjet XT-7 is currently the most powerful weapon in Captain Power's arsenal. Lord Dread orders all Bio Dreads to report sightings directly to Volcania where he will monitor all information on the craft's capabilities. Warning: The Powerjet XT-7 contains elements still unknown to the Empire. All engagements with the craft require full power generation. Caution: Ion Blasts from the Powerjet XT-7 will penetrate all Bio Dread shield systems. Contribute pictures, update details or suggest corrections for Power Jet XT-7. Write a review about Power Jet XT-7.